← Finally, something to talk about. It appears that there is a divide between people who feel that Howard Lincoln’s interoffice memo was simply a meaningless pep talk to his employees, and those who, like me, think that there was a little more motivating it. Look, I have no idea what the actual intention of the email was, but I wrote what I wrote yesterday out of frustration. I’ve had a very rough summer – some of the things that have occurred in my life this year have been extremely difficult to deal with, and while I absolutely will not air my laundry here, I will say that there were times when the game of baseball and my desire to write about it were all that was keeping my feet firmly planted on the ground. I didn’t just want to watch baseball this year, it provided me with something stable and constant, which I might not otherwise have had. So Lincoln’s dismissal of all things media (and fan) is a bit of a slap in the face. I have gone through financial and personal trouble to be at games this year, and as a paying customer feel that I (and indeed all of us) deserve to be thought of as fans who want to see this team go to a World Series, not clapping monkey ATMs that look forward to bobblehead night or seeing our names on the scoreboard. Your mileage may vary, of course – this is just my deal. 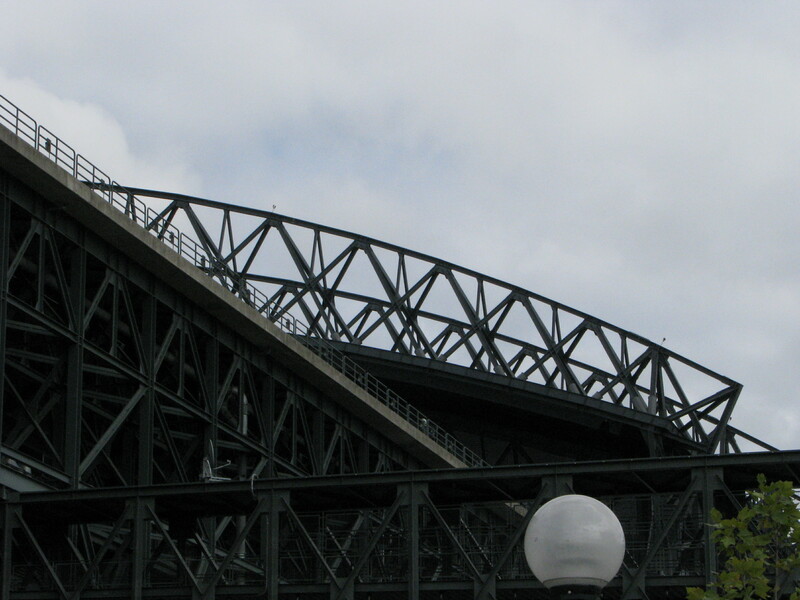 Home plate entrance, taken from the kitty-corner side of 1st Ave S and Edgar Martinez Drive. I keep forgetting to grab a shot of the “Batting a Thousand” sculpture just inside, the chandelier made from a thousand opaque plasticine bats. Maybe today’s the day. The south corner of the rolling roof, with the suite-level walkway in the foreground. Also, a lamp. Seeing the roof open from the east side of the stadium, it really doesn’t look big enough to cover the whole field. I suppose that is the miracle of modern engineering. Earlier this year, I noticed a catwalk on the west side of it, underneath. Just once, I’d love to watch a game from that vantage point, despite the fact that I have a healthy fear of precarious heights. If I make it to 100, maybe I’ll request it. 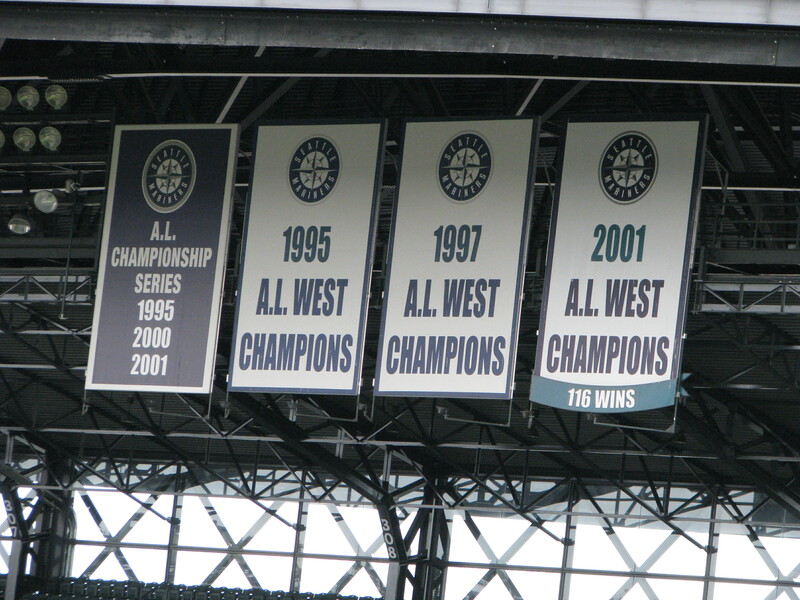 I wasn’t around for any of this – had just moved to Seattle when they were racking up their 116 wins. I guess three AL West championships isn’t so bad, considering the age of the team itself. 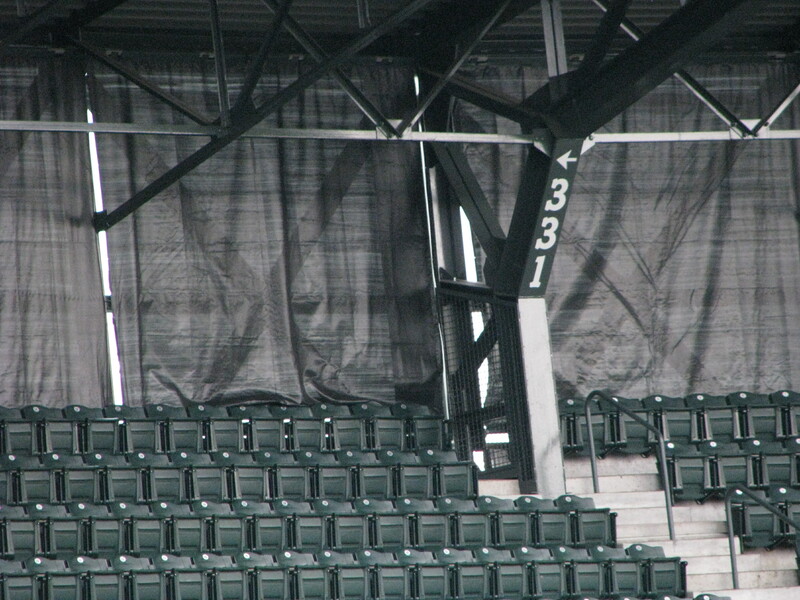 Then again, how sweet would a World Series plaque look up there? Don’t answer, I’ll tell you – pretty sweet. This is the original photo from my current header. I took it for no other reason than that I felt like taking it. Also, to use as a header. Later today while David Pauley is taking on Jered Weaver (*headdesk*), and someone from the Rainiers is up against someone from the Sacramento Rivercats. I have looked everywhere, not even the Rainiers’ own site has probables listed for tonight’s game (if anyone knows, please feel free to post it here). I have already convinced myself without a doubt that I will enjoy the game, however, so it doesn’t really matter to me – Ian Snell? Sure, bring it on. Ryan Feierabend? Whatever. Andrew Baldwin? Alrighty. So raise a glass to Triple A ball tonight, and a sweep for the Rainiers. Let’s bring the pain to Sacramento! 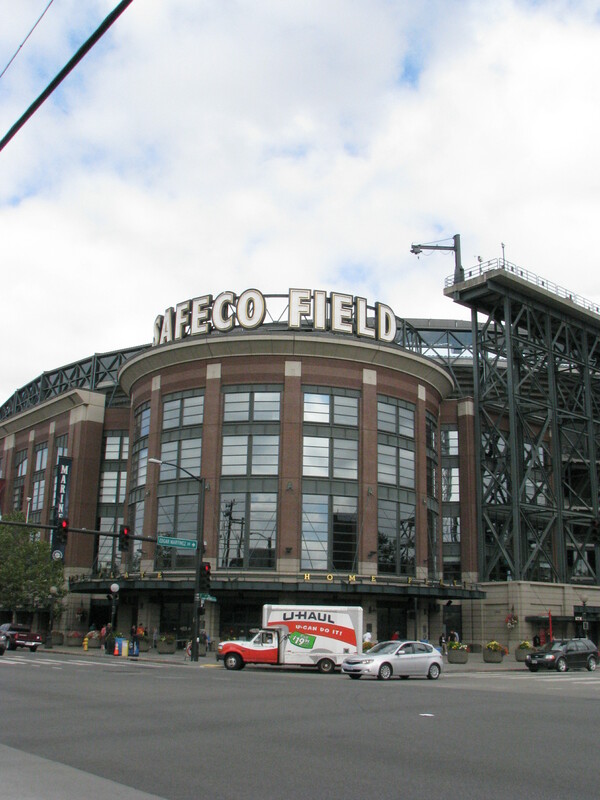 This entry was posted in Uncategorized and tagged fridays at safeco. Bookmark the permalink. I believe it is Robles! I’ll be there! Information on the series has been hard to obtain. I saw his name mentioned as the started earlier in the week but then they stopped mentioning the probables. Hope we see a winner! Enjoy! Hope you managed to make it there today. Last night’s game was super disappointing. What a bummer. The Rivercats apparently decided to send down Vic Mazzaro, which wasn’t terribly fair to the Rainiers, but I guess if the Oakland A’s aren’t winning anything this year, they figure they might as well try and rig their Triple A team to do so. Beautiful day, cold beer, good friends, great seats behind home plate, lousy outcome! Oh well, hope they win on Sunday. Woooo! Saw it all over Twitter last night. 🙂 Do you have a Twitter account, BTW? Do I follow you? Who are you on there?